Kris Whipple is a canine massage therapist certified in Canine Therapeutic Massage, Sports Dog Massage and Senior Dog Massage. She is a graduate of the Rocky Mountain School of Animal Acupressure and Massage (RMSAAM) where she studied canine anatomy, physiology, orthopedic pathology, gait and movement, massage techniques, and holistic health. 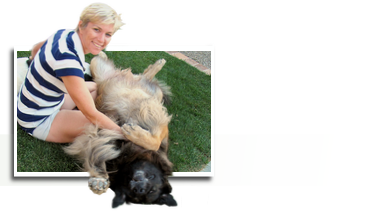 Kris is also member of the International Association of Animal Massage & Bodywork. Kris’s role as a canine massage therapist culminates a lifetime of working with animals, starting as a horse trainer and riding instructor in high school. In college she became a licensed wildlife rehabilitator and worked with injured hawks, owls and eagles at the University of California, Davis, Bird of Prey Center. She was a student at the Exotic Animal Training and Management School at Moorpark College, CA. There she learned positive training techniques while working with exotic species ranging from wolves to water buffalo. After graduating with a degree in Parks and Natural Resources Management, Kris spent the next 25 years working in zoos, aquariums and conservation-related facilities in California and Florida. For 13 years she was the Curator of Education for Walt Disney World Animal Programs where she led educational programming at Disney’s Animal Kingdom, Discovery Island, EPCOT's The Seas and the Tri-Circle D Ranch. During that time she worked with top animal behaviorists, wildlife researchers, veterinarians and animal care professionals and expanded her animal knowledge and skills by working with a variety of exotic species. Today she participates in agility, treiball, nose work and rally with her Corgi/ Australian Shepherd rescue dog, Rugby. * For more information on Moorpark College, click here.